Let’s learn how the pawns move and capture. Remember: when looking at diagrams like the one above, White move up (from the bottom to the top), Black move down (from the top to the bottom) when looking at drawn chessboards. A pawn moves one square forwards. 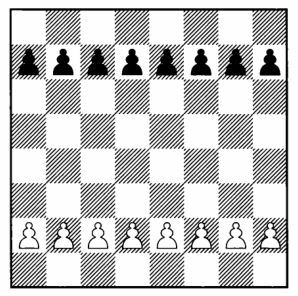 However, on their very first move pawns are allowed to move either one or two squares forward (note: this means on the pawn’s first move, not just on the first move of the game). 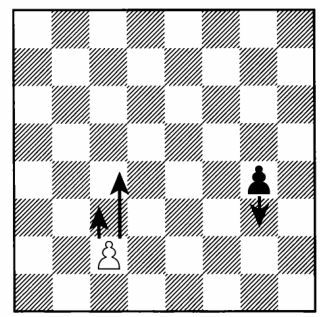 Every pawn can choose to move 1 or 2 square when it is its first move. In the example above, the White pawn can move 1 or 2 squares (as this is its first move). The Black pawn can move 1 square only, as this is not its first move anymore. Pawns can only move forward. They never move backwards. piece of your own or your opponent’s). A pawn captures one square forwards diagonally. It can capture all the other pieces. 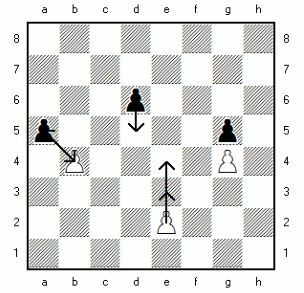 The pawn in e2 can choose to move to e3 or e4, and the pawns in g4 and g5 are blocked by each other. Now practice some games with pawns with your dad and mum and some puzzles with pawns.